Aqua Craft Products® produces Super Sacks® (bulk packaging) with sizes up to 2400 pounds that will hydrate 8000 US gallons of full strength sea water working solution (35 ppt. @77F/25C). 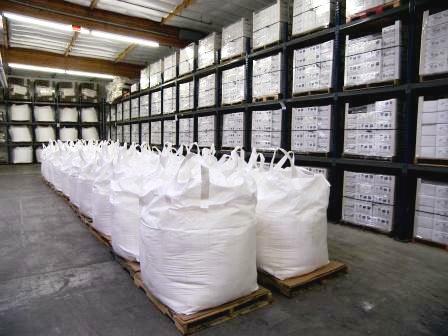 Aqua Craft Products® bulk or Super Sacks® are produced in an environmentally controlled dry room. Each bulk sack is lined with a form fitted special moisture barrier liner. Factory sealed and undamaged bulk or Super Sacks® will keep the the contents as a dry, free flowing power for up to one year. Regardless of storage conditions. This without the addition of any anti-caking or free flowing agents. Aqua Craft Products® bulk sacks are manufactred for public aquariums and/or other large scale marine salt users. The sack is lifted over an 8000 US gallon mixing vat with a fork lift. A draw string is pulled and the entire contents are used at one time. Aqua Craft Products® bulk sacks are not suitable for partial usage of the contents. E.g. Bulk sacks of marine salts are not intended to opened, a small portion is removed, the bag close, several times. If this is done, salts will attract ambient moisture, become damp, cake, hard and change chemistry. Serie’ D™ formula (Premium Lobster Salt™). ECOSEA® flexable formula. ECOSEA® can be manufactured to suit a variety of special applications. The amounts of: Mg, Ca, K, So4, carbonate hardness, pH, etc. can be blended to your exacting requirements.